Are helicopter pilots bound by FAA regulations? Are there limits on how many hours a pilot can fly a plane? How can I discover who is at fault in a charter plane crash? Browse or search our FAQs for answers to common questions about aviation accidents. What are the most common causes of injuries on airplanes? Aviation accidents can occur at any point between takeoff and landing, and not all injuries are the result of a crash. Even if the plane makes it from point A to point B safely, passengers and crew members can suffer a variety of painful and even life-altering injuries that can cause suffering for decades after the incident. In-flight accidents are common on commercial airlines, but they also frequently occur on small aircrafts such as corporate jets, charter flights, or helicopters. Aviation laws give injury victims the right to file lawsuits against the airline, its employees, or even the manufacturer of a defective component of the aircraft for the effects of a serious injury. Turbulence. Turbulence plays a role in the majority of injuries sustained while an aircraft is in flight. 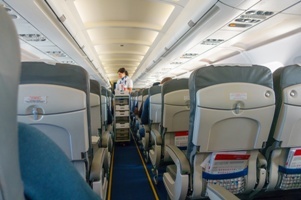 Even small changes in altitude can cause the plane to shake or drop suddenly, and the unpredictable nature of turbulence can lead to passengers hitting their heads against windows, tripping or falling on the way to the restroom, or even being thrown from their seats into the hard surfaces of the cabin. Turbulence injuries may range from scrapes or bruises to twisted ankles and broken bones. Luggage. Luggage falling from overhead baggage compartments causes thousands of injuries every year, a number of which may increase as airlines continue to charge for each piece of checked luggage. Overhead baggage compartments may suddenly spring open during flight as a result of turbulence, faulty latches, a cabin crew’s failure to store items safely, or merely as a result of overloading the compartment. Passengers seated underneath the compartment door may suffer broken noses, facial lacerations, or collarbone injuries when struck by carry-on items, while those struck by heavy luggage may suffer concussions or skull fractures that lead to traumatic brain injuries. A severe blow to the head may require extensive treatment, cause memory loss and irreversible personality changes, and prevent the victim from returning to his or her normal life. Adverse medical events. If a passenger or crew member suffers a heart attack, stroke, or other medical emergency during a flight, the pilot should make every effort to provide lifesaving treatment—including landing the plane before the final destination. The pilot should communicate any in-flight medical emergencies to ground staff—and if the crew does not have adequate equipment or medical staff on board, the pilot should be able to divert the plane. Airlines may be held liable for the mishandling of a medical emergency even if the airline did not cause the original event. Food service. Food services may be necessary on long flights, but they can also carry injury risks. A food or drink cart that has not been properly secured may roll forward, striking the arms or legs of passengers who are seated on the aisle. Spoiled or uncooked meals may cause passengers to suffer food poisoning, while the presence of nuts or other allergens can lead to adverse reactions and anaphylactic shock. Finally, a failure to provide food in a timely manner can cause passengers with diabetes to experience low blood sugar or insulin shock, leading to a diabetic coma. Commercial airlines may not be able to guarantee the safety of their passengers, but they do have a heightened duty of care while transporting passengers. A commercial carrier can be held responsible for any injuries caused by the negligence of its employees and pilots, or if its standard operating procedures unnecessarily place passengers at risk. If you were injured while traveling by plane, we can conduct a thorough investigation to determine who is responsible for your suffering—and we do not collect any legal fees unless we secure you the compensation you deserve. Simply fill out the short contact form on this page to set up your no-cost injury consultation, or learn more about your rights in our free guide, The 10 Worst Mistakes You Can Make With Your Tennessee Injury Case.